The aim of academic posters is to share information at conferences, seminars, and exhibitions. They can tell about some complex issues, and thus it is essential that the information on them is well-organized, readable, and eye-catching. While creating a poster, it is critical to take care not only about its visual appearance but also about its content. Approach 1 – One-piece method involves creating a poster in one large piece. The design is elaborated by means of different software applications, such as Microsoft Powerpoint. It is usually performed in A3 or A4 size and after that is enlarged at the printout stage. The distributed poster space is broken down into some separate panels. It can be comprised of such elements as text, images, tables, or titles. Standard word-processor and presentation software are the best tools for this method. The panel method can be flexibly used and adjusted to changing layouts. This approach is attention-grabbing and makes your poster distinct from the rest. What is the purpose of your poster – to present findings, put forward an argument, persuade an audience, or endorse a product? Who is interested in your poster? What is your audience searching for – elaborate information or a concise summary? Where will your poster be displayed? Is there any instruction with the defined content of your poster? Having defined the content of your poster, you should think of the way your information will be displayed. By drawing an outline, you can wisely use the space allocated. Your structure must be comprehensible and logical so that viewers could easily follow the flow of information in your poster. To provide a readable flow of information, consider mapping out your poster on a grid system. Having laid out the parts of your poster, you need to print out rough samples of the text, use scissors, and glue to cut things out. It will help you to apply different sequences and spacings to see the exact quantity of information required for an efficient display. Having decided on the location of your information, you can start working on your final poster. To achieve good results, you need to be knowledgeable about some design principles of organizing your material. Sticking to them will secure you a good feedback from your teacher. How to Create a Powerpoint Template? Font. Pick a font that is readable from a great distance. Most of the usual fonts are appropriate for this (e.g. Helvetica, Palatino, Times). Avoid applying too many fonts since it can look scruffy. Two is a happy medium; one for the headings and one for the main information. Type size. Keep in mind that your poster will be viewed by people standing at around a meter away and thus the text should be easily read at a distance. Apply large type sizes (24 and 36 points). Titles and headings should be more sizeable than your main text. Try to minimize the number of type sizes. Otherwise, your paper will look awkward. Line spacing or “leading.” Applying one and a half or double spacing between lines makes your poster design more legible. Alignment. Most word-processing packages enable you to align your text in various ways on the page; you can choose between left, right, center, and justified. Try not to resort to alignments since it can sometimes look out of place. Left aligned is the best to read, especially when applying a large type. Case. Text in UPPER CASE is hard to read, even being very close to the presentation, and thus it is better to avoid it. Colors can make poster design appear in a new light, and provide you with a new method of underlining some aspects of your information. Pick colors that correspond to each other so that they do not distract from the information in your poster. Do not apply a miscellany of colors, otherwise, your poster will look messy. Presenting your information on a poster enables you to show your data in a riveting and creative way. Think of how you can improve your poster by means of pictures, tables, charts, or photos. The insertion of even one well-chosen picture can significantly make your audience more interested in your poster. 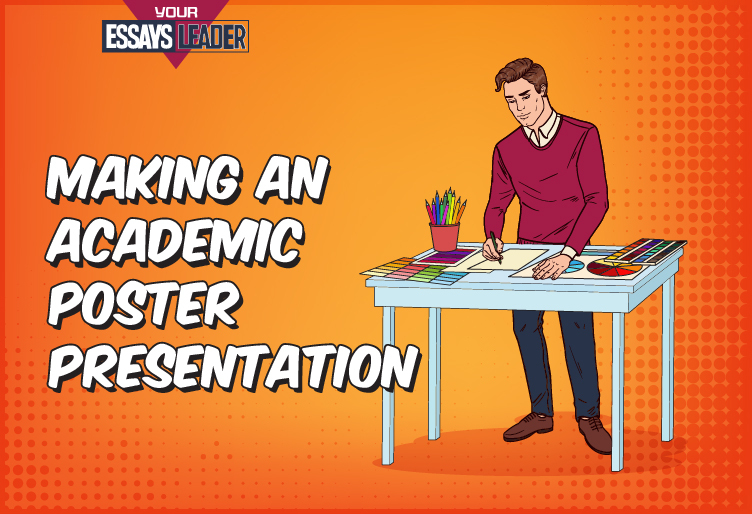 Poster presentations can be performed in many ways. You may be asked to stand near your poster, conversing with people as they browse and answering questions about the information you presented. Also, your poster can be just a part of a general display. You can come up with some ways of helping interested viewers to take information away from your poster: making printed A4 copies of one-piece posters or short summaries of panel posters are indeed efficient ways of communicating your information. Creating academic posters is an extremely effective way of putting across information to a great majority of people. However, it can be quite challenging to create a poster that is both visually attractive and informative. Still, if you take pains to make an engaging and interesting poster, you are certain to reap outstanding results.